Cisco SFP module, compatible with 1000BASE Gigabit Ethernet standard is a hot-swappable input/output device that can plug into a Gigabit Ethernet slot of Cisco switches and routers. Cisco, as a telecom giant supplies a whole series of fiber optic transceiver modules available in 1000BASE-T, 10/100/1000BASE-T, 1000BASE-SX, 1000BASE-LX, 1000BASE-EX, 1000BASE-ZX standards. It is truly dizzying to choose from a whole array of Cisco SFP transceivers, and each often has only minor differences between them. Thus, to help customers choose the suitable Cisco SFP modules, this article will clearly introduce several Cisco GLC modules. Figure 1 shows Cisco SFP plugging into the Cisco Nexus 9396 switches. 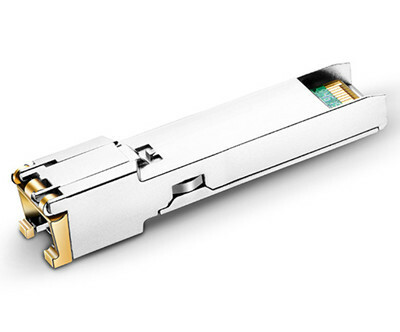 GLC-T is 1000BASE-T Cisco SFP copper 1g module, compliant to IEEE 802.3, operates over Cat5 copper wire for a distance of 100m. 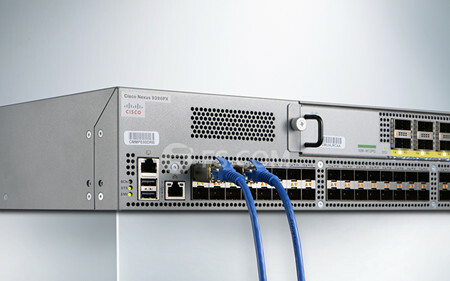 Cisco GLC-T fiber transceivers provide 1Gbps data transfer for full duplex Gigabit Ethernet connectivity. Similar with GLC-T SFP modules, GLC-TE provides a link length of 100m over Cat5 copper wires. The only difference between these two SFP modules lies in the operating temperature range. GLC-T SFP is commercial temperature range (COM) from 0 to 70°C (32 to 158°F), while GLC-TE is Extended temperature range (EXT) from -5 to 85°C (23 to 185°F). Figure 2 displays GLC-TE SFP module with RJ45 connector. GLC-SX-MMD resembles with GLC-SX-MM module. Both are the Cisco 1000BASE-SX SFP modules operating at the wavelength of 850nm. When connecting with OM2 multimode fibers, this optical transceivers can support up to 550m. However, GLC-SX-MMD allows data rate of 1000Mbps with digital optical monitoring (DOM) support, which performs transceiver monitoring and troubleshooting operation. SFP-GE-S is compliant with 1000BASE-SX standard. It operates over multimode fibers with a wavelength of 850nm at 550m. Unlike GLC-SX-MM, SFP-GE-S support DOM performance and extended operating temperature range. Compliant with 1000BASE-LX/LH standard, Cisco GLC-LH-SMD can support a large longer distance of 10km. The letter “D” also refers to the DOM support. It operates at longer wavelength of 1310nm over duplex LC single-mode fibers. Cisco GLC-LH-SM-20 is the advanced version of GLC-LH-SMD, which operate at 1310nm wavelength through LC connector with a transmitting distance of up to 20km. GLC-EX-SMD is the Cisco 1.25Gbps SFP module that is compliant with 1000BASE-EX standard. It operates over 1310nm for distance up to 40km. Compatible with 1000BASE-EX Gigabit Ethernet standard, this Cisco SFP also support a link length of 40km with DOM support. But unlike GLC-EX-SMD operating at 1310nm, this optical transceiver module works over 1550nm wavelength. As the name implies, Cisco GLC-ZX-SM is compliant with 1000BASE-ZX standard for single-mode fibers. When used in Cisco 2960 switch, it can support a link length of up to 70km at 1550nm. If the GLC-ZX-SM with a distance of 70km can not meet your network requirement, then you can use the GLC-EZX-SM-100 modules for 100km. GLC-EZX-SM-120 with a operating wavelength of 1550nm can reach up to 120km over single-mode fibers. This article lists several Cisco SFPs with detailed specification, such as the media type, supporting distance, wavelength, operating temperature range, etc. If you have Cisco switches and don’t know how to choose the suitable SFPs.